The development of ActX has already finished. Now you can use MaCoPiX as the next generation of ActX. 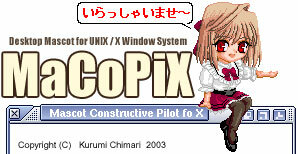 MaCoPiX (Mascot Constructive Pilot for X) is a sort of desktop mascot application for UNIX / X Window System. MaCoPiX is using Gtk+(1.2 or 2.x, you can select it) and gdk-pixbuf. So you can get much better GUI accesibility and much easier instllation. Furthermore, now, over 100 mascots are released for MaCoPiX. If you have a GTk+ environment, please use MaCoPiX now!